Kitakyushu City, in the Fukuoka Prefecture of Japan has launched “City Bike”, an electric bike-sharing program. 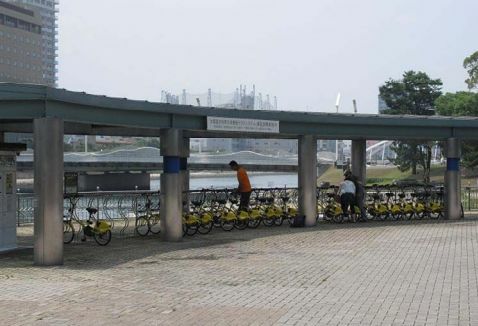 In order to earn its title of environmental capital, the city contracted the non-profit Town Mobile Network Kitakyushu to operate the bike-share service. Since March 27, 2010, 116 bikes have been available at 10 stations throughout the city’s downtown area. July 2010 saw an average of 41 people ride a city bike each day. Users sign up for the program online or at one of three manned stations where they receive a membership card. With their card, a customer can release a key and battery from one of the many electronic stations throughout the city. The customer may can then unlock the bike with the key and insert the battery into the bike, at which point they are ready to ride. The bikes cost 105 Yen (US $1.27) per hour, with additional fees for keeping a bike for over 5 hours. Arlington County, Virginia, USA has a public process where it provides many opportunities for Arlingtonians to contribute to ensure the best possible results are created in providing public services for its citizens. Time-consuming, but thorough, "the Arlington Way", as the County calls it, is being used for the selection of the County's next round of 30 stations, growing its share of the regional Capital Bikeshare service to nearly 50 stations. MetroBike, LLC is the program manager for Arlington's fleet, so I wanted to share what we're doing to generate public comment, so that the new stations will best service folks who live, work, or play in Arlington. The public process includes a public meeting, to be held tomorrow (6/27) for the general public to comment on locations in the dense urban corridor where the stations are planned for this fiscal year. Next month we will present again the locations to civic associations for those neighborhoods which will receive a Capital Bikeshare station. We'll also notify businesses and residents who are near proposed station locations through a letter. An innovative public outreach tool that I'm excited about is an interactive map, developed by BikeArlington, which will allow the public to comment on our proposed locations and suggest locations of their own. 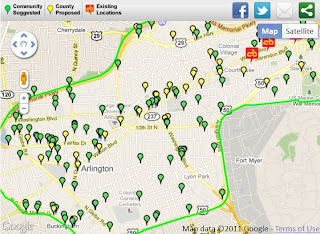 On the interactive map, County-proposed locations are shown in yellow, community-proposed locations are in green, and existing stations are shown with the Capital Bikeshare logo. The public may like or dislike any location and comment with their reason. All comments for any respective proposed location are shared with the viewer by clicking on a proposed station. With over 150 comments since the webpage was launched last week, the interactive map is proving popular. Through all this public feedback, we'll be sure to install our stations where people will use them most. Korea - The first day of November 2010, Seoul, Korea officially began an experiment in bike-sharing with a one year pilot program called SeoulBike. 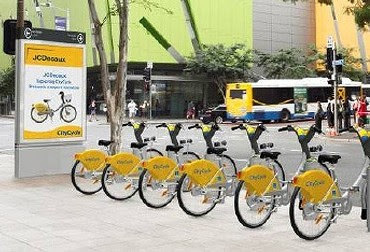 Serving just two small areas of this huge metropolis, this month the system with only 440 bikes in 43 stations surpassed 110,000 trips according to Seoul's City Government. Even in such limited areas, each bike is used 1.7 times a day. It would be more, but the initial "no charge" usage period is 4 hours! Each additional 1/2 hour after that is 1,000₩ ($1 USD). The subscription rates are: 7 days for 3,000₩ ($3 USD), 30 days for 5,000₩ ($5 USD), 6 months for 15,000₩ ($15 USD) and at the beginning of the pilot, the 1-year subscription was 30,000₩ (about $30 USD). We'll come back and take a look at this system as it moves on from its pilot status and grows throughout other areas of Seoul. China - It's getting interesting with China's two mega systems. It was announced by the Hubie Daily News that Wuhan, China's system now has 51,500 bikes, which is about same number as Hangzhou, China's system. Wuhan plans to expand its system to 70,000 bicycles by the end of this year. Hangzhou currently with about 53,000 bikes and expects to have 61,500 bikes by the end of this year. By 2015, Hangzhou projects to have 100,000 bikes according to China's TLNews. In this bicycle race, which of these cities will claim the "Maillot Jaune" (or yellow jersey, to borrow Tour de France parlance) of the largest system in the world at the end of the year? Speaking of the Tour de France, the entire country of France has less than 42,000 bikes in all of its public bike-sharing programs! China is again the Kingdom of Bicycles. France - Last week the 100,000,000th trip was taken on a Vélib' in Paris. As proof that bike-sharing is such a global phenomenon, the event was celebrated by the Japanese television show "Yatta" which means "You did it!" Australia - Brisbane started CityCyle at the beginning of October 2010. There are around 100 stations and around 1,000 bicycles. 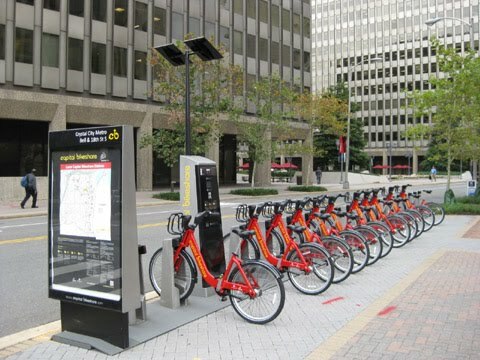 Washington, DC started Capital Bikeshare at the end of September 2010 with also around 100 stations and 1,000 bikes. Both cities have low lying central business districts and hilly residential areas. Both cities get hot in the summer. The City of Brisbane has three times the population of the city of Washington, but as a region, only one-third the population of the DC-area. A more striking difference is the respective bike-sharing usage numbers. Over about the same period of time Washington has had over 550,000 bike usages and Brisbane has had around 50,000. There are 5,200 subscribers to CityCycle and 15,200 to Capital Bikeshare. Both cities are planning large expansions of stations and bikes for their respective systems during 2011. We at The Bike-sharing Blog have to ask: What is going on "down under" that has put the Washington system so much on top? Starting today, Deutsche Bahn, the German railway company, is offering the Mobilitätskarte (Mobility Card) in Berlin. This could be the start of the future for bike-sharing membership cards. This card not only offers access to the new Call-a-Bike StadtRAD system, it also is an all-zone VBB, or Berlin Brandenberg Public Transit, pass which provides access to train, tram, subway, and bus, in addition to access to a new all electric car-sharing program. All that is missing from this card is parking meter payment! The card costs €78 ($112 US) a month which includes a €50 ($78 US) credit for use of the car-share program. Since it is a trial, the card is only available for sale this month, but can be renewed for three months. The Bike-sharing Blog will be watching the acceptance of this card by bike-share users in Berlin. This type of all encompassing bike-share transit card will be a hallmark of 4th generation bike-sharing. 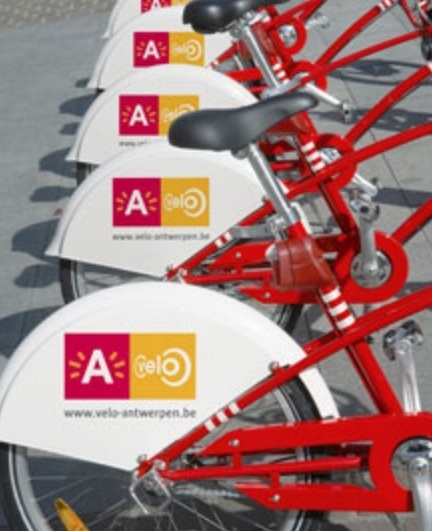 Known for its many flavors of craft beer, Belgium now will be known for its flavors of bike-sharing with the launch of A-Velo in Antwerp on Thursday June 9th. This will be another Clear Channel European system. With 85 stations and 1,000 bikes to start, the system will grow to 150 stations and 1,800 bikes in two years. The yearly memberships, which are available now, cost €35 ($50 US). There is a weekly pass at €7 ($10 US) and a daily at €3 ($4 US). As is customary, there is no charge for the first 30 minutes and each additional 30 minutes escalates in price. An interesting twist for membership is that if users keep a bike for 4 or more hours on three different occasions he or she will loose the bike-sharing privilege! Kudos to Elizabeth Press of StreetFilms. She made a great video on the huge bike-share program in Hangzhou, China. Since she filmed this in depth study on the largest bike-sharing system in the world, the Hangzhou Public Transport Group has been adding more bikes to reach 60,600 bikes at 2,711 service points for this year.